About Migas: Migas or “crumbs” are a traditional leftover dish in Spain made from leftover bread. Originally a rural dish, prepared for the workers in the field, migas can now be found in restaurants and households all over the country. In Torrox, Spain, they celebrate La Fiesta de las Migas the last Sunday before Christmas, in the Plaza de la Constitución. At this festival, a giant vat of migas is prepared and shared with all attendees along with a small glass of local wine. Fernando and How to “Make” Crumbs. Years before anyone reading this story was a twinkle in their father’s eye or smile in their mother’s heart, there was a tiny town called Torrox. Torrox was a beautiful little town with two towers, and two beautiful churches. In Torrox there lived a crotchety old soldier named Fernando. Fernando was small and had fine, bird-like features. His nose was long and sharply tapered and his eyes were tiny and black. 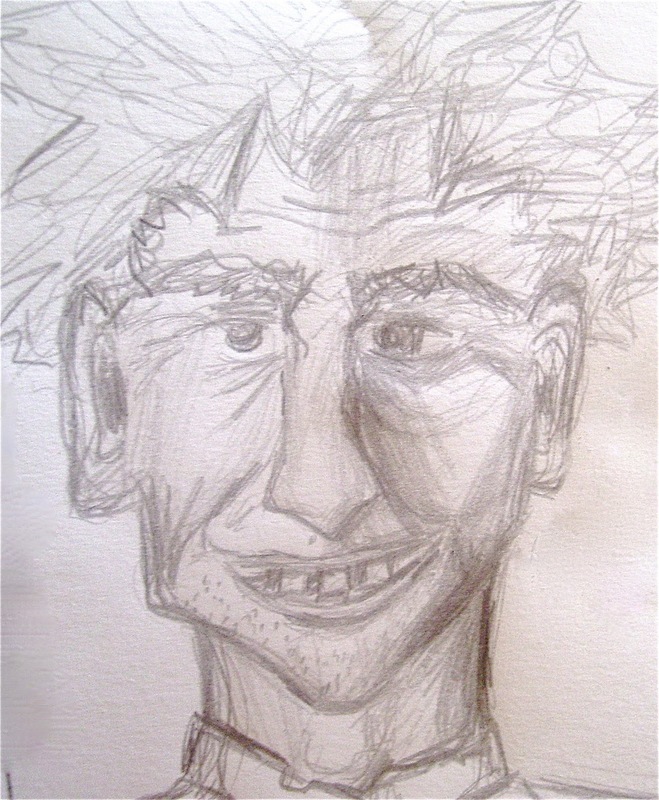 His smile spread wide revealing gaps and yellowed teeth over a narrow, pointy chin. His hair was white, but most of the time looked gray or brown because he almost never got around to taking a bath; his clothes were raggedy and full of holes, and no cleaner than his hair. Most of the time Fernando slept outside under the stars wrapped in an old blanket he carried rolled up on his back. For the most part, Fernando’s life was exactly as he liked it. Maybe he wasn’t rich, but the kindness of the townspeople insured that he rarely went hungry, and without a house or a job to tie him down, he was free to do as he pleased. When Fernando was young, he had been a soldier in la mili, or the Spanish Army. To anyone who would listen, he would say that those had been the best years of his life. In la mili he had always had a tent to sleep in to protect him from la lluvia, the rain, and a good hot meal whenever he needed one. It was during his army days that Fernando learned to cocinar, to cook. Daily, when Fernando would wander around the town, and ask the townspeople and storeowners for whatever food they could spare him, he would boast about his cooking skills. Besides being able to make la mejor sopa en todo España, , the best soup in all of Spain, from a few chicken bones, Fernando loved to brag about how he could feed an army, with just some migas, crumbs. So it happened, that one cold winter day, when Fernando was swaggering around and boasting about his migas superespeciales, the mayor, who had been listening to Fernando’s exaggerations for years, decided that maybe if he challenged Fernando to feed the entire town with just some migas, and Fernando failed, Fernando would find something else to brag about. So that Fernando would feel obliged to accept his challenge, the mayor decided to challenge Fernando in la plaza mayor(the main square) al mediodía (at noon) on a Saturday when most townspeople would be out and about. “Fernando,” called the mayor to the old soldier, who was at that moment hobbling around and holding out his tin cup and smiling at donors. “I challenge you to feed the entire village using just some migas. If you can do this, I will make sure you have three meals a daysiempre, always, and a warm place to sleep away from la lluvia, whenever you should want it. If you don’t manage to feed everyone with crumbs, then you can’t brag about your cooking ever again. Fernando’s cheeks bunched up into an impish grin and he swiftly agreed. First of all, he requested the largest iron sartén, or skillet that the mayor could find, some water, and all of the day old bread and bread crumbs that the villagers could gather. With his main ingredients gathered, Fernando put the ingredients to make migas en the sartén with the water, and left them overnight. That night Fernando slept by his skillet full of bread and water under the stars. The next day, when the sun rose, Fernando requested wood for a fire to further prepare his migas, and once the fire was built up started to stir his migas, and he stirred and stirred them, until a local farmer bringing in his wares to sell at the local mercado (market) came by. “ Bueno….well, I do have some leftover chunks, they’re small, but for flavor they would work, no? “Por supuesto! Of Course! Gracias!” And in went the chorizo and Fernando kept stirring the migas. 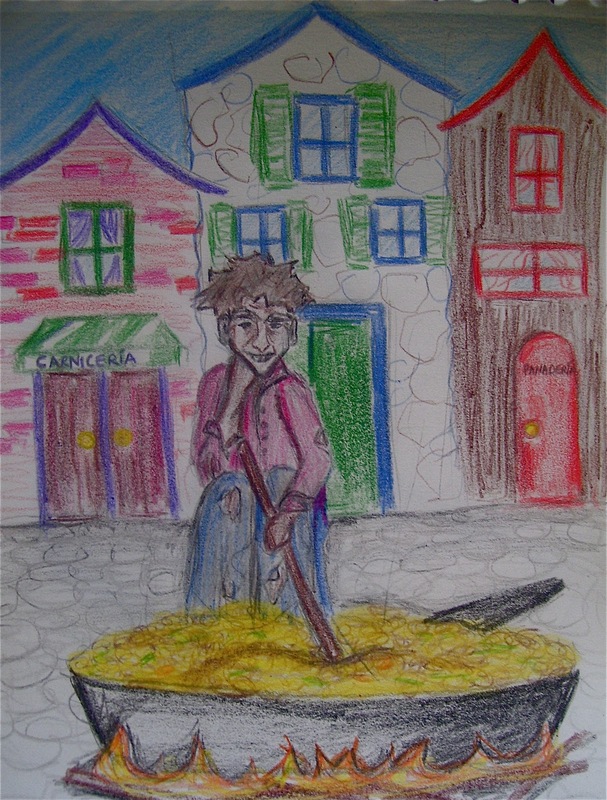 As farmers went to market and store owners opened shop, each and every one of them was lured to the main square to admire Fernando’s migas and most of them ended up adding something to the big sartén, peppers, onions, eggs anything they offered up, Fernando threw into the sartén and mixed with his overworked stirring arm. Soon it was noon in the plaza mayor again and the square was crowded with people led by their noses to the square, plates and spoons in hand, all anxious to try Fernando’s crumbs. And one by one, Fernando plated out the migas to the townspeople, and gradually the square fell silent except for the sounds of spoons scraping plates and people gulping and chewing Fernando’s migas. Finally, as Fernando was scraping bottom of the huge sartén, the mayor came forward with his plate. After Fernando filled his plate, and the mayor tried a bite, he grabbed Fernando’s now very tired stirring arm and raised it high. “ Tú Ganas, you win Fernando, while I’m the mayor, you will have three meals a day and a warm dry place to eat them whenever you like. You were right to brag about your cooking, these migas are deliciosas. Quizás, maybe next week you can make your special bone soup. Copyright 2011 Chris Ciolli. All Rights Reserved. First Published in the Tipton Times unless otherwise noted. Thanks for reading. Head to Midwesternerabroad.com for more good stuff! © Midwesterner Abroad. Premium WordPress Theme.